Cooling tower maintenance is a crucial part of facility maintenance. A poorly maintained cooling tower can have a negative impact on public health, overall system efficiency and operational costs. In order to provide education on this important topic, Goodway Technologies hosted a free webinar discussing the impact of neglecting cooling towers and providing tips on how to execute preventative maintenance. The webinar, “Preventative Maintenance for Cooling Tower Systems” is available to view now. Did you know that drift, small water droplets, from a contaminated cooling tower can carry Legionella and other bacteria up to 2 miles from your facility? 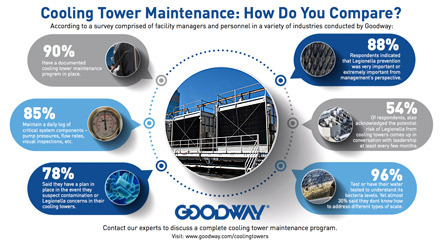 These cooling tower maintenance and cleaning steps, along with Goodway’s cooling tower products, will help keep your facility and cooling towers clean, safe, energy efficient and help you meet ANSI/ASHRAE Standard 188-2015! It’s happened again. Tests indicate Legionella bacteria have contaminated the water supplies of the University of Windsor, in Canada, for a second time. Facilities in major metropolitan areas may be facing a similar threat of outbreaks if they do not mandate and enforce the proper maintenance of cooling towers and water supplies. Studies have shown that 40 – 60 percent of cooling towers test positive for Legionella so the problem will likely not go away on it’s own. Is there any good news here? 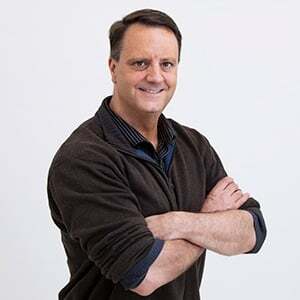 Well, New York City is the exception in this battle against Legionella, as their Codes to Protect Against Legionella are some of the strictest in the nation. Cooling tower maintenance is a crucial part of facility maintenance. A poorly maintained cooling tower can have a negative impact on public health, overall system efficiency and operational costs. In order to provide education on this important topic, Goodway Technologies is hosting a free webinar discussing the impact of neglecting cooling towers and providing tips on how to execute preventative maintenance. The webinar, “Preventative Maintenance for Cooling Tower Systems” will take place on Tuesday, June 12, 2018 at 2 p.m. EST. Register for the free webinar here.